Run analysis is the study of human biomechanics associated with a running athlete, which is the science concerned with the internal and external forces acting upon the human body and the effects produced by these forces. There are primarily three components analysed which have an effect on skeletal, muscular and neurological tissue. Kinematics - The study of movement from a geometrical point of view. This is the motion a physiotherapist can see and assess. Kinetics - The study of biomechanics concerned with what causes a body to move the way it does. What forces drive that motion. Neuromuscular control – What neuromuscular control effects kinematics and kinetics? Good running form to improve performance and efficiency has been a debate that’s evolved over time. However, many factors contribute to a good running form, and have often in previous years been over complicated. Most runners experience injury at some point, but by changing your run shoe to alleviate the injury is not looking at the overall bigger picture. Accumulative load – Looking at the intensity of run training plans, the pressures of competition and goals to achieve, and the frequency that load is placed on the tissue. Extrinsic factors – Taking into account the training environment, trails, track, road running, climate and altitude. All of which challenge a runner’s capacity to tolerate load on the tissues. 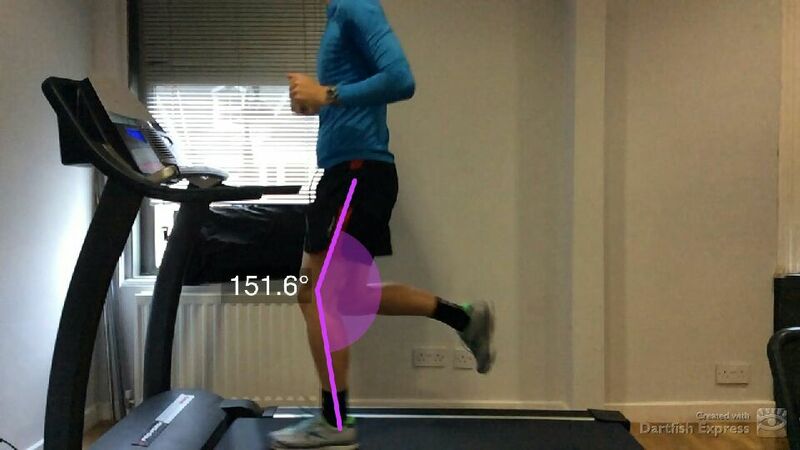 Intrinsic factors – Analysing the biomechanics of each runner. Studying strike patterns, loading, angle of the base, propulsion, stride length, step rate and foot positions to name a few. At Physiohaus we use video motion analysis to accurately determine any habitual running problems that may be a contributing factor to a runner’s injury. Equally we can use video motion analysis for a runner wanting to improve running form, enhancing their performance within their chosen sport. Once a physiotherapist has carried out a thorough assessment, analysed video footage, a training and rehab plan can be implemented with the runner and training coach. Reducing injury risk to a runner is a priority. By shifting load away from irritated painful/pathological tissue, we can increase the capacity to attenuate load in a graded approach over a period of time. This will allow a runner to continue with a prescribed rehab training plan, alongside any physiotherapy treatment if needed. Will any potential changes have an impact on other structures? Motor learning takes time, by working with a runner we can monitor progression and adaptations to a run programme. We need to keep in mind the fundamental basic principles of run rehab, and keep adapting to the capacity and goals of the runner. What are the goals? 10k, half marathon, marathon, ultra-marathon, triathlon, or Ironman. Whatever the runner’s goals are, run analysis can aid in injury recovery and prevention, while improving performance and run form. Give us a call on 0191 2817703 for more information.